A stunning unique gift that has been hand cast and polished to a shine and designed just for people celebrating their twelfth anniversary. 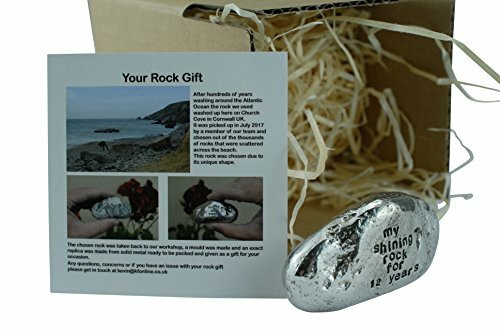 This rock has been casted from a real rock found on a beach in Cornwall UK and casted into solid metal weighing a total of 180 gramms approx. Polished to a stunning shine the twelfth anniversary rock features the words 'My Shining Rock for 12 Year'. A really unique gift that is perfect for people celebrating their twelfth anniversary, an item you won't find anywhere else. If you have any questions about this product by Pirantin, contact us by completing and submitting the form below. If you are looking for a specif part number, please include it with your message.